Rez is an audio-based shooter, where the combat is about rhythm. When it came along in 2001, rhythm games were still mostly a rarity, not the heavily established genre they are today. Sure, there were a few, but nothing like Rez. Hell, there hasn't been much like Rez before or since. Rez was the brainchild of Tetsuya Mizuguchi, who would go on to make other fantastic games as Lumines and Space Channel 5. Mizuguchi started working at Sega building arcade machines like Sega Rally, but eventually he founded United Game Artists, who were created to make more experimental fare. Space Channel 5 was the first game from that group, and it was a dancing game with trippy space age visuals. From that, came the idea of Rez. 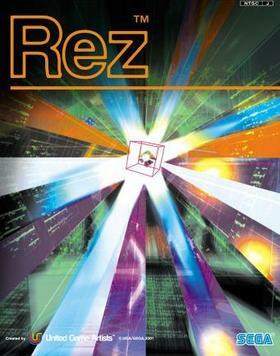 At its core, Rez is simply an on-rails shooter, a kind of game that's been around for a long, long, long, long time. The "on-rails shooter," for those of you less familiar with videogames, is a shooting game where you only have a limited amount of mobility, and have to concentrate more on shooting things out of the skies than you do avoiding things (although avoiding things is also important) because you aren't choosing the general path - it's on a rail, like a ride at an amusement park. But that's where the similarities end, because Rez is more interested in the experience than it is being an overwhelming challenge. See, all the sound effects in Rez make music. You heard me. The game itself becomes a form of music creation, and somewhere along the line, your senses start to blur. You start killing enemies to a rhythm, which in turn, generally makes you play better. You are, for all intents and purposes, riding a groove. Each playthrough will sound similar, but different. You are, after all, playing a game and making music at the same time. Also, each area in Rez has music put together by a different artist, with Area 5, the last, big world before the boss fights, featuring music from Adam Freeland, a track called "Mind Killer," which has become a staple in my workout mixes and fast driving mixes. From here, I turned into a Freeland fan, and at some point, I'll probably write about his music. The game's graphics, as you can see, have a visual style unlike pretty much anything else in videogames. It's inspired by the Russian painter Wassily Kandinsky, and has a very unique look - empty polygons, neon lines, flat backgrounds - you will get an experience that is singular in games. When Rez came out, it didn't sell that well. However, the game because the classic "sleeper hit" as people found the game in rental places, bargain bins and through word of mouth. Eventually, copies of Rez were going for as much as a couple hundred bucks on Ebay, and the game was reprinted, something that is extremely rare in the world of videogames after a title goes out of print. Years later, the team remastered the game for HD and it went on sale on Xbox Live Arcade, where you can still get it, and absolutely should. Rez got a sequel/prequel of sorts called "Child Of Eden" that was good, but I think the marketing leaned too heavily on the game's support of the Kinect/Move, which, at the time, were still very much fringe products. It's still out there, though, and if you like Rez, you should pick up Child of Eden as well. Sadly, Mizuguchi has reportedly turned mostly to development and isn't really directing games any more, but we can all hope he'll come back and bring us another amazing musical experiment at some point in the future. Until then, go and find the cult hit that is Rez.